The soul of our Dearly Departed Druid may have long ago taken leave of the Emerald Isle, but his black Celtic knot- and gold dust-covered cranium endures, embodying the brave mystical warrior spirit of the Celts and their present-day descendants. 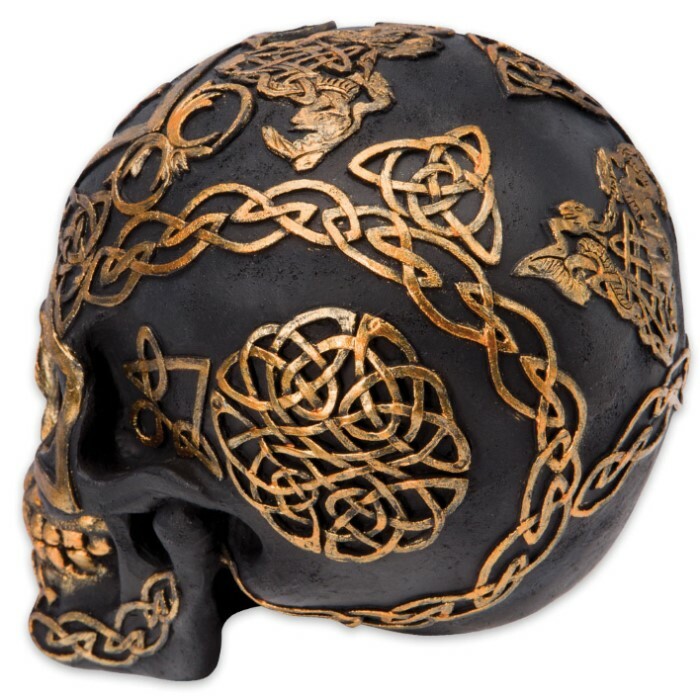 Show pride in your Celtic heritage with this exquisitely detailed black ornamental skull sculpture, decked out with an assortment of Celtic knots and other symbolic patterns like the triquetra (a.k.a. Celtic Triad), Bowen knot, Canterbury cross and pendragons. As a Druid, our Dearly Departed was a religious man of high status and wealth; thus, it’s only fitting that his teeth, bony ridges and raised pattern outlines are accented with antiquated gold hues. 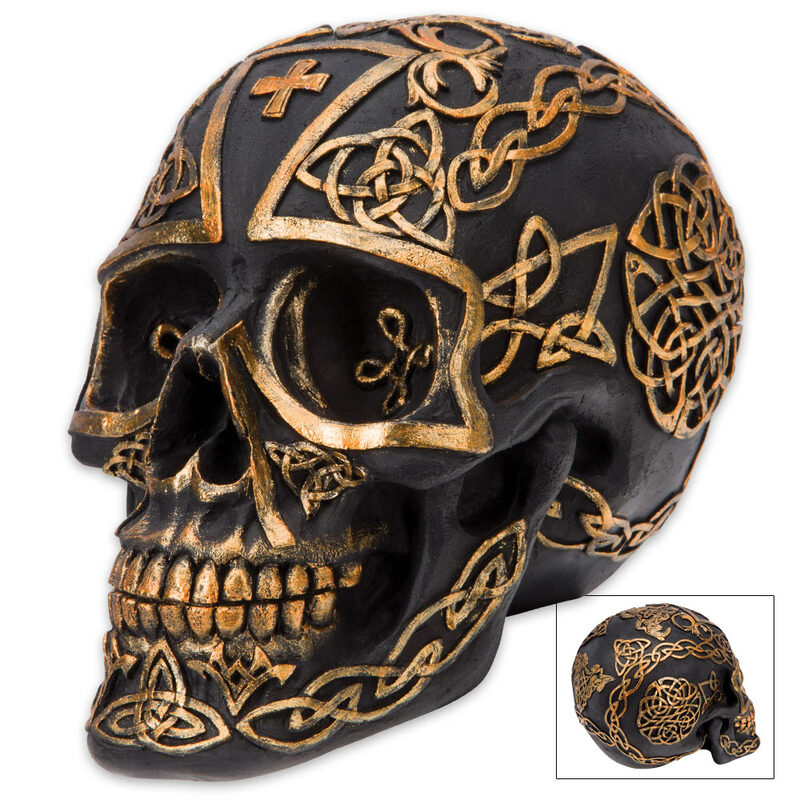 The Celtic Cranium is forged with durable cold cast resin, made to last a lifetime. Proudly display our Dearly Departed Druid on your mantle, desk, coffee table, dresser – anywhere you want to proclaim your proud Celtic heritage. An equal opportunity icon, our Dearly Departed Druid takes delight in livening and visually enriching anyone’s home, office or studio, regardless of his/her ancestry. His Celtic Cranium is a bit smaller than the average human’s, but at 4 1/2" high x 4” wide x 5 1/2” deep it’s ideally sized for home décor – amply visible but fits easily on most furniture or fixtures. 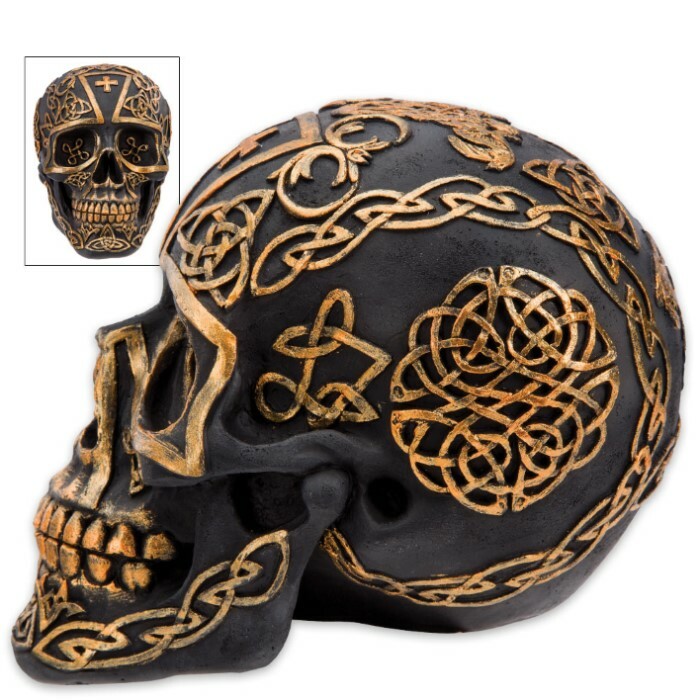 You won’t find our Dearly Departed Druid’s Celtic Cranium anywhere but here, and if he had penned a will, we’re sure he would’ve decreed your home as his final resting place. Don’t let the ancient warrior priest down! Bring him home today to rest in peace. As a fan of the Dresden Files, this is what I thought the skull he carved would be like. The painting is ok. I plan on installing LEDs in the eyes. The skull is very nice. I gave it 4 stars instead of 5 stars because the gold paint on the symbolic patterns is very sloppy (many missed areas and over-painted areas). It should look a lot better after I touch up the paint.